Please view the color / gel options and choose hereafter. 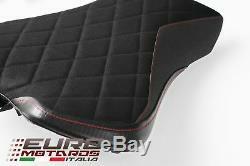 Introducing the diamond edition seat cover for your street triple 765! Featuring a luxurious synthetic suede seating surface quilted with our famous diamond stitching. Tec-grip side panels add grip while carving corners and carbon fiber panels add style to your ride. Stand out with the finishing touch of luimoto! 10212101 black suede / tec-grip / cf black / red stitching. 10212102 black suede / tec-grip / cf black / black stitching. Custom made to order (production about 2 weeks). Optional gold gel pad for rider US $ 90.00 - requires professional installation. 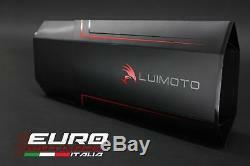 Custom made in canada by luimoto designer covers. By purchasing this custom made cover you can confirm it 2-3 weeks to produce. This is the cover only, not including any base / pan / plastic or foam. We are authorized distributors since 2007 and carrying all available options for your bike. We can use generic images for visual presentation, items may differ from photos. While we are trying to keep a wide variety of items ready, we are looking for 7-21 days may be needed for production. 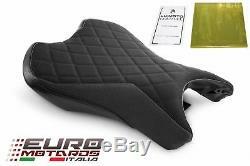 Luimoto, creator of seat covers. Please choose the color / it is also possible to improve the comfort by adding an optional gel sheet below. 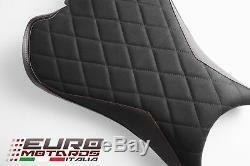 Here is the diamond edition seat cover for your street triple 765! 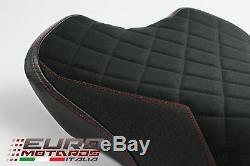 Featuring a luxurious synthetic suede seat surface quilted with our famous diamond stitching. The tec-grip side panels add grip while sculpting the corners and the carbon fiber look panels add style to your ride. Stand out with the final touch of luimoto! Additional options: (send us a message or mention your choice during your payment). Custom made to order (about 2 weeks to production). Take advantage of the option "special gold conductive gel cushion" for 90.00 usd - requires professional installation. Custom made in Canada by luimoto creator of covers. Perfectly replaces oem - excellent quality at the best price. By ordering your custom-made cover, you agree that the time required for production can be 2-3 weeks. The proposed article includes only the seat cover alone. No support, tray, plastic or foam is included. As an authorized distributor since 2007, we are able to provide you with the full range of options available for your motorcycle. The photos used on the site have illustrations value, therefore the items may differ from the photos. Any order placed from abroad is shipped in fast mode, is insured and can be followed online. Although we strive to have the widest range of products available, it may take 7-21 business days to manufacture. If you think we can improve this description or make a comment, please contact us. We have been online distributors since 2006. We started by supplying exotic parts of the world. We are going to race and own bikes, so we care about your duke, r, ninja, blade, or gixer, and share your riding passion. The item "seat cover front luimoto diamond suede triumph street triple 765 2017-2018" is on sale since Tuesday, June 26, 2018. 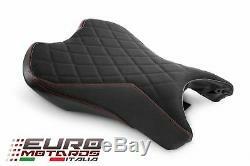 It is in the category "auto, motorcycle parts, accessories \ motorcycle \ spares \ seats, seats \ "Saddle cover". The seller is "france-euro-bikers" and is located in Canada. This item can be delivered anywhere in the world.